Enjoy our studio unit located in Sapphire Village Condominium development! 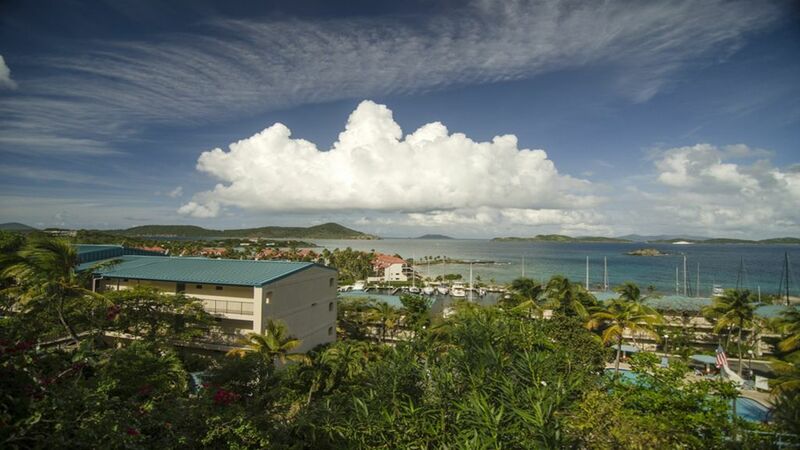 Our unit is smoke-free, pet-free, full air conditioned (brand new spit a/c unit), and offers breathtaking views of neighboring USVI and BVI. You will certainly enjoy the new restaurant on property, Slice VI! There isn't a bad thing on the it's way more than just wonderful pizza. On Sapphire Beach, there are opportunities to rent beach equipment and enjoy beach/water activities, at an additional cost, as well as a yogurt/coffee shop and a bar and restaurant. While we have been in the real estate business for years, we decided to do it in a place that we truly love and have been traveling as a family for several years. We know that you will fall in love with the island as we have. My husband and I are both from the Midwest and really want to make your stay as enjoyable as possible. One parking space available per unit. Must obtain parking pass upon arrival from management office. Great views and great Beach! My wife and I really enjoyed our stay. The condo was the perfect size for the two of us. Coffee on the balcony with the amazing view was very relaxing each morning. The condo had everything we needed. Since the condo is on top of the hill it is nice and quiet. Red hook was just around the corner which has restaurants, shopping, and the ferry to St John. Sapphire beach next to the condo and was by far our favorite beach - even compared to some of St John’s beaches! Several thoughtful consideration on details for kitchen items including ice cube trays, garlic press, spices, etc. Also appreciated the beach chairs that were provided as we were able to take those with us to the various beaches and not rent chairs. Overall rental was clean, with the exception of the floor. When we got out of shower every day, by the time we got to the kitchen which is not that far, our feet were black. Found it tough to crawl into a bed with white sheets with dirty feet. Chalked it up to construction dirt, but believe that it may not have been cleaned with water. Swept, but not mopped, perhaps. While consideration was given for some things in the kitchen, it lacked in others, such as paper items. We were there 8 evenings and were given 3 rolls of toilet paper for two people, no paper toweling or napkins of any kind. We were also given four washcloths, two shower towels and one beach towel, each for the entire stay. There is a laundromat, but we would have had to purchase detergent. Also, the grill was out of propane, which we asked to be replaced, but it never was. We had to purchase charcoal/lighter fluid to make a couple of meals there. If you haven't been to this island, food and toiletries are VERY expensive. 4-pack of toilet paper and one roll of paper toweling was $11. Stick of butter $3.29; gallon of milk $5.00, etc. Beautiful area, but still recovering from hurricanes. Lots of construction going on. Chickens also start their morning routine about 4:00 a.m. I really enjoyed my stay here, but I would have enjoyed it more if I had had commercial TV along with the ROKU tv. The bed was very comfortable. And I appreciated the beachtowels and the beach chairs. I just wish the beautiful ceramic tile floor had not been covered with paint spatters. Also, I would have appreciated a kitchen towel and dish rack. Drilling and hammering beginning at 7:30 am didn't bother me too much and I assume it won't go on forever. Access to Slice VI restaurant, pool and taxi/safari was really good. The property was nice overall, and was maintained nicely. Unfortunately the host of the property didn't tell me that the building was still under construction. I had to ask worker's to try to keep the noise down after 9pm. Then they were back 7:30 the next morning. I wouldn't have chose this particular property if I had known that drills and hammers were going to be my 7:30 wake up call. Thank you for your feedback. As the entire Caribbean region was devastated by Irma and has been and is being rebuilt (most hotels are under construction until 2020), I am one of the first owners to have my units back and ready (completely updated/remodeled) for vacation rental. The working hours anytime (hurricane recovery or not) in our association are from 8am-6pm Monday through Friday. I will certainly take note of your complaint and address it with the office. Accordingly, the $150 nightly rate reflects any possible inconvenience you may have experienced as most other comparable lodgings on the island at this time (high-season) are listed at $250-275/night or have a minimum night stay requirement.